Waratah blooms are a symphony of curved florets, cupped by a skirt of petal-like bracts. 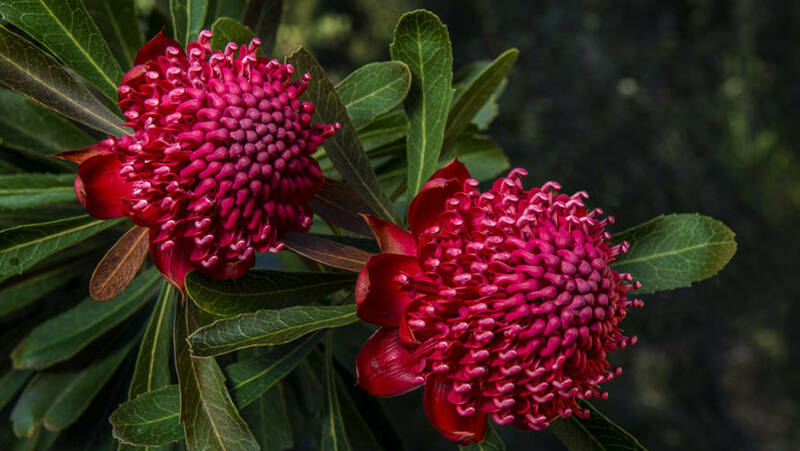 If you think of waratahs, deep blood-red is the common image, but over the years the colour choice has expanded and today you can enjoy varieties in pure white, pink and soft golden-yellow. Waratahs are mainly spring flowering, evergreen shrubs, occasionally reaching small tree size in the wild. They belong to a very small genus of plants – just five species – and are endemic to New South Wales, Victoria and Tasmania. Telopea x corroboree (left) is a dense, medium/large shrub with broad grey-green foliage and large flat flower heads providing nectar for honey eating birds. It is a cross between Telopea speciosissima and Telopea mongaensis, giving this plant great hybrid vigour. A great feature shrub for general garden beds, rockeries or large container in full sun to part shade and a fantastic cut flower. 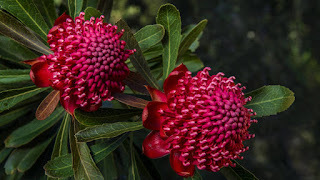 The NSW waratah (Telopea speciosissima) is the best-known species – it is the floral emblem of NSW and is grown commercially for its superb cut flowers. Waratahs will flourish in free-draining soil in either full sun or partial shade. Like all members of the Proteaceae family they are highly sensitive to too much phosphorus so best to use a fertilizer low in phosphorus.